I am not a vegan. I feel at pains to open this review with this fact, especially as I arrived at Café SoVegan’s home, the Royal Sovereign pub on Northwold Road, with my girlfriend. She follows the vegan diet that I sometimes feel I should follow too, given the often catastrophic environmental impacts of meat consumption, not to mention my waistline. Nonetheless I felt on more familiar ground once I’d figured out that, aside from the open kitchen and serving area, this café is situated in a classic London boozer. There’s a spacious beer garden (festooned with posters advertising charity drives and the local cricket club) and a covered area where we chose to plonk ourselves. There, we mulled over the daily specials board, before deciding the main menu was too generously stocked with options (pancakes! a burrito! how on earth do they make quiche?) to overlook. We ordered four dishes, all to arrive at once. My partner let me have the first bite of the Café SoVegan Seitan Burger, which we both ended up considering the standout of the afternoon. Not to bring things back to meat unnecessarily, but the seitan (a ‘meat’ made from the protein in wheat) had a firm texture and meaty succulence that was really a revelation – especially for my dining partner, a veteran of many a flavourless vegan mush-burger. The patty is perfectly seasoned and peppery to boot, and the optional guacamole served as an extra ace-in-the-hole (vegan cheese and/or bacon can also be added.) 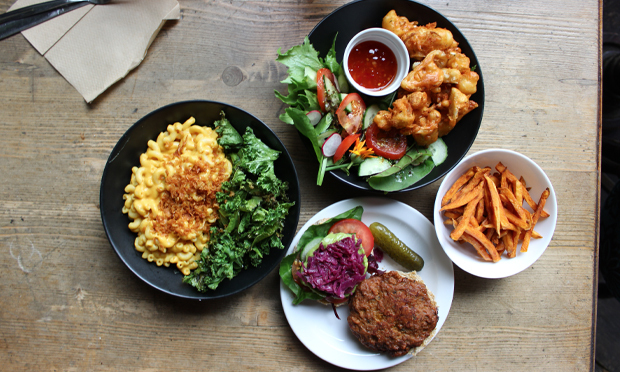 At £5.50, it’s excellent quality and value for any kind of burger in the capital, and it comes with a wonderfully fresh Hackney Salad, comprising leaves plucked from Growing Communities, the Stoke Newington social enterprise and organic veg connaisseurs. I had the Mac ‘no’ Cheese: visually the same, if not as the luminous boxed variety, as the snappily packaged Mac ‘n’ Cheeses you see served at various London watering-holes. (Refreshingly, the portions here are much bigger.) The dish uses butternut squash in its base, and is then enhanced with turmeric, smoked paprika, crispy onions and of course, “cheese”. Vegan cheese, from what I hear, is an eternally difficult thing to get right – it seems where one aspect of cheese is achieved, such as meltiness, one is sacrificed somewhat. Here there is a slightly missing cheesy tang to be borne in mind. It all has a lovely warm comforting effect though, especially with the accompanying kale. This adds a salty, semi-crisp texture that works excellently in the mix – showing the real culinary skill that married co-owners Michelle O’Mahoney and Davina Pascal are able to bring to this food. The two other sides, which we opted to share, confirmed Café SoVegan as a proposition that will appeal to vegans and non-vegans alike. Firstly – sweet potato fries. These really can come out with varying degrees of success, a truism that I’ve demonstrated with weary regularity at home. The ones here strike a really good balance of crispness and flavour, and obviously go brilliantly with a pint. The second was the Cauliflower Nuggets, which I was particularly in favour of ordering, as chicken is the only thing I’ve eaten in nugget form before. These were battered cauliflower pieces with a delicious spicy warmth, light as a feather and without a hint of greasiness – a really worthwhile addition. 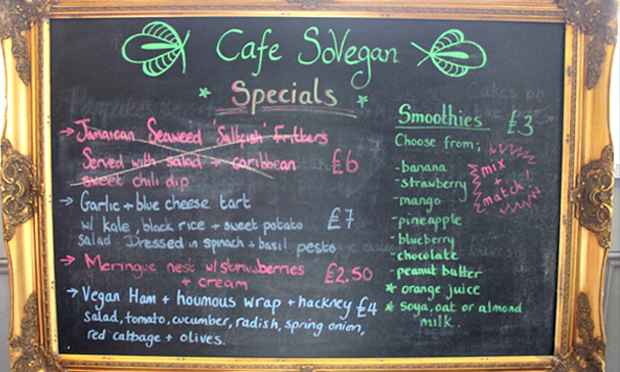 Given the paucity of fully-vegan restaurants in the country as a whole, Café SoVegan is a project to be heralded. Vegans with a taste for comfort food will be in raptures, and omnivores like me, if not totally converted, at least walk away knowing what “seitan” means – and why they may well be dining SoVegan again.